Shop local: 68 cents of every dollar spent at locally owned Garden Centers stays in the community* | PittMoss® from the Ground Up! ← Retiring old notions about saving for the future! Ditching the 401K to fund a Business! We were out at Johnston’s Greenhouses yesterday, under cloudless blue skies and temperatures in the seventies, to prepare for the delivery of some new production equipment. 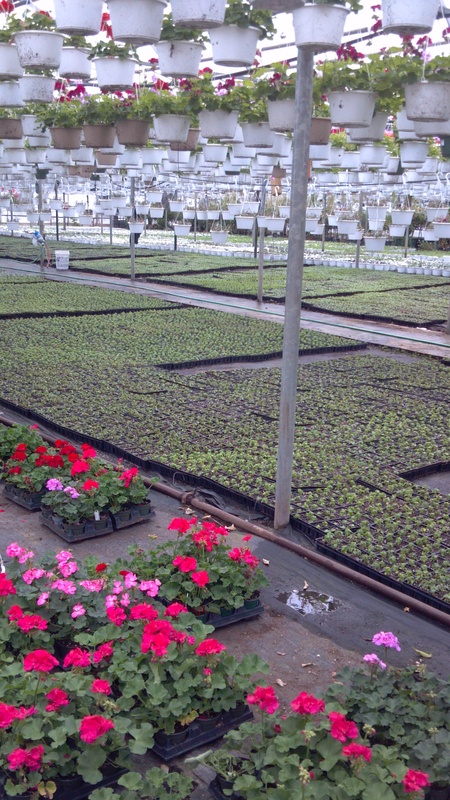 I have to say being back at a greenhouse, on a beautiful spring day, with employees scurrying around helping customers fill their trunks with hanging baskets, flats of annuals and vegetables, really took me back to my roots in the retail side of the industry. My first real career after college was managing the garden center at several locations of a retailer in Chicagoland. Unfortunately, the popular regional chain did not survive once national big box home improvement stores moved to the region, but by that time PittMoss™ research was underway. This time of year can be challenging for any employee in a garden center and can be described as Christmas on steroids. You know the scene; frazzled employees being peppered with a dozen different requests or questions, lines backed up at the registers, cashiers calling for change or check approvals, a need to find those ever elusive stockers for a carry out or to round up carts. Then there were the inevitable phone calls coming in throughout the day. “Mr. Handley, customers holding on lines one, two and three”. So not all the memories of being back at the garden center are particularly pleasant ones but that is what this time of year is all about. Satisfy your customers at all cost! This busy six to eight week period from late April through early June is make or break for many independent garden centers, which are likely at their most vulnerable. An owner of a family operation like Johnston’s are extended financially, emotionally and physically at this time of year and the only recourse is to trudge on day after day, serving the all important customer. One beautiful blissful day in June you’ll suddenly notice that the calls have subsided, customers have thinned, the remaining inventory of plants is limited and you’ll finally find the stock guys. A life outside of the garden center can now be considered until the fall rush. Golf anyone? Johnston the Florist provides plants wholesale throughout the Pittsburgh area and has four locations of their own http://www.johnstontheflorist.com/locations.html. At their country place location there is a pretty modern building on busy Lincoln Way that was their retail garden center up until this year. That building is now a year round wedding reception and event venue and the garden center has been moved near the greenhouses, past the family homestead and barn. The move allows the family operation to have year round income from hosting weddings and the positioning of the garden center, feet from the production area, is very clever on many levels. This area of their operation has been a behind the scenes production area for over a century, when the current owner’s great grandfather built the entire greenhouse operation from the ground up. This family dynasty of Pittsburgh area flower growers, led by Steve and Mark Guffey are shrewd to invite their customers to see the nuts and bolts of their farming operation, bubble gum, Band-Aids, duct tape and all. Customers want to be engaged, they want to be part of something were being told by experts. Meeting the actual growers who know something about your plants besides the current sales price and seeing the complex, ancient waterworks, antiquated steam heating systems that tangle around the polyhouses and buildings like kudzu on a telephone pole certainly provide an authentic experience. The hard work, ingenuity and can-do attitude of the place that customers will surely appreciate, also inspires my crew and it makes us believe we can build our own business with a large dose of luck. Showing off their greenhouses as part of a garden center customer experience is pure and simple brilliance. Of course, we knew these guys were smart. After all, they’ve started to use PittMoss™ to grow their plants and became our business partners. This entry was posted in Uncategorized and tagged business, entrepreneur, environment, garden, garden center, Local, Nature, retail, small business, start-up. Bookmark the permalink. Spoke with brother Mark Guffey yesterday and he corrected me about one aspect of my post. Back in the day, Johnston The Florist’s Country Place Garden Center was up and around the greenhouses. It was moved down to the building on Lincoln Way when he was a kid so the return to the original location is part nostalgia and economics.